More Of Him: Women of Faith - Bible Study Review & Giveaway! 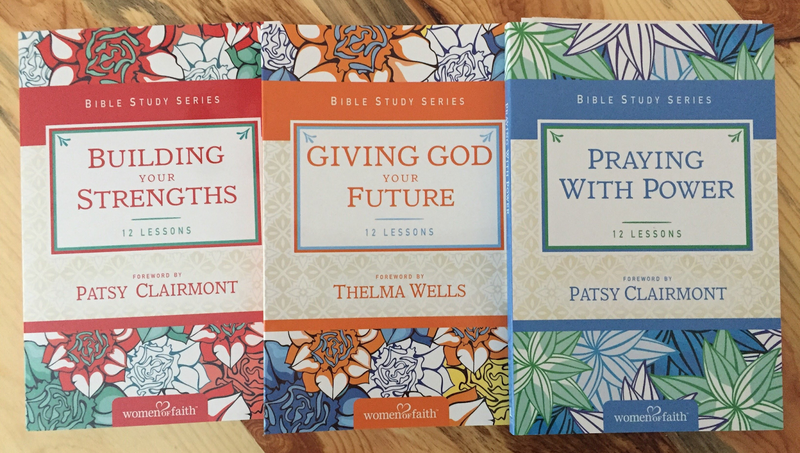 Women of Faith - Bible Study Review & Giveaway! 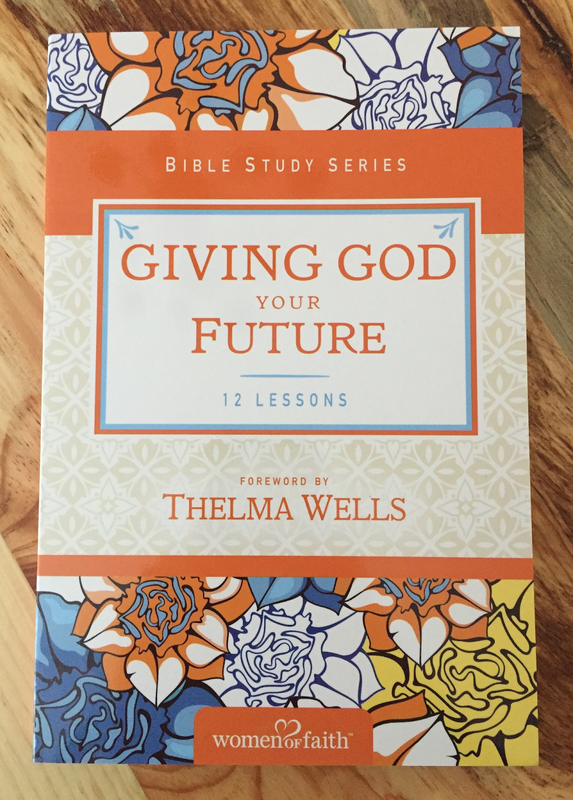 Giving God Your Future foreword from Thelma Wells. "It sure makes life a lot easier to handle when all the responsibility of planning your future is left up to the Master of the Future." - Thelma. In this book you will explore what Scripture says about giving everything to God and surrendering to Him. Throughout the 12 lessons you will be able to pray your way to giving up control and give Him your future. This study looks at what the Bible says about trusting God enough to give Him our all and being able to say, "Not my will, but Yours be done." 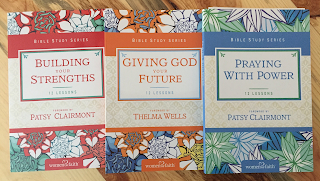 When I saw these studies, I knew that I was going to love them all, but especially, the study by Thelma Wells called GIVING GOD YOUR FUTURE. 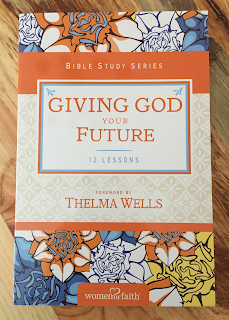 I have loved the teaching of Thelma Wells for many years and this study title resonated very much for me. Many of us worry about our futures and fret about what our futures hold. This study gives us the tools, through Scripture, to give our futures to God and entrust to Him the plans He has for us. There are Twelve Chapters and each one has a series of questions whose answers are easily found by looking them up in your Bible. There are also very inspiring quotes on most pages from favorite Christian women teachers. At the end of each chapter there is a Ponder and Pray Section. In this, Thelma encourages and leads you how to pray over what you have learned. After this section, there is a Section called Trinkets to Treasure. This section gives you an object to think about that reminds you of God's promises for your future. I also like that there is a full page for making notes and prayer requests at the end of the chapters. You can easily do a chapter per week, dividing the questions into two or three per day so you can really focus on them. I enjoyed doing it on my own, during my quiet time, however, is would be a great small group study. This study helps you to dig deep into the Word of God and you have a much deeper understanding of Him and all that He holds for your future. I highly recommend this study and give it 5 out of 5 stars. I was very generously given another set of the studies to give away! The winner of this giveaway will win all three studies! To enter, please leave a comment on this post telling me which study sounds most exciting to you. The winner will be randomly chosen and announced next week. I would love to win Praying with Power. Thank you for entering me in your giveaway.